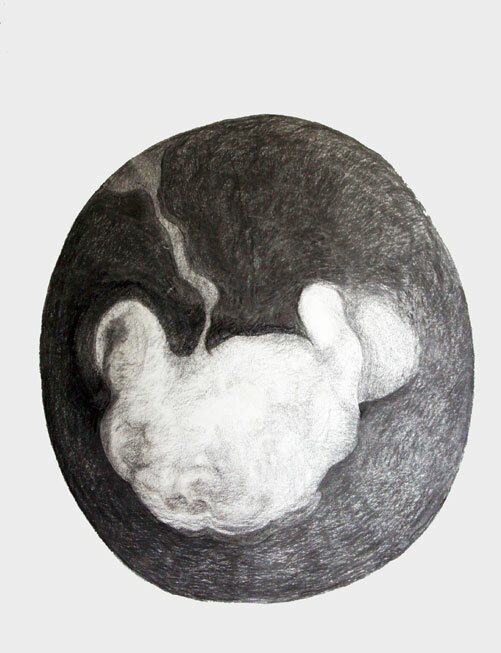 Nearly but not Quite is a series of six large drawings on paper. 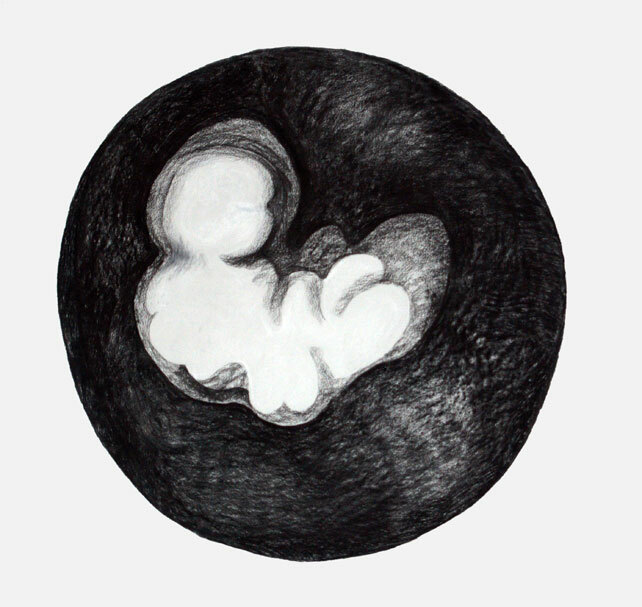 Each piece of paper is roughly the size of an adult human and the drawings are deliberately executed in basic materials, which in this case are charcoal and chalk. Charcoal because as ash it is associated with penitence and mourning as in ‘sackcloth and ashes’, and chalk for the association with whiteness. Whiteness as a covering blanket, concealment, a secret wrapping of something. The images are executed as drawings because drawing is a direct physical product of the eye, hand and brain. During the act of drawing like most artists I find that a close relationship, a sort of knowing and recognising flows between the studied image and myself. 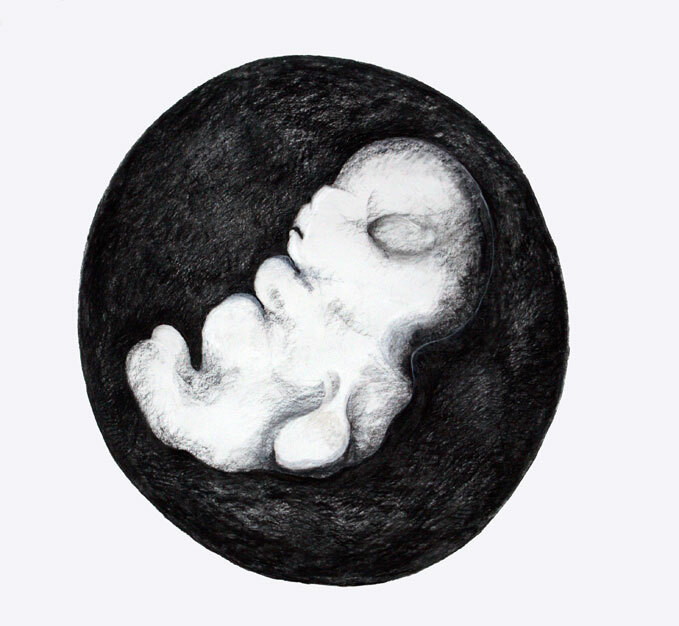 Each drawing is a portrait of a human embryo which is destined to miscarry. In other words no heart beat has been picked up on ultrasound, and these embryos or babies are in fact dead but not yet delivered. Science wise the term expelled would probably be used; to the parents losing a baby in this way carries a different interpretation. The trigger that directly initiated the making of this work is a paper that I heard presented at a conference on the Clinical Aspects of Early Pregnancy Loss, A winter symposium organised by the European Society for Human Reproduction and Embryology Special Interest Group on Early Pregnancy held in Liverpool in 2005. The title of the paper was Embryoscopic and cytogenetic analysis of 233 missed abortions: factors involved in the pathogenesis of developmental defects of early failed pregnancies (Phillip T, Phillip K. et al 2003). Embryoscopy enables the embryo to be photographed in the womb and cytogenetics is another name for chromosome analysis. 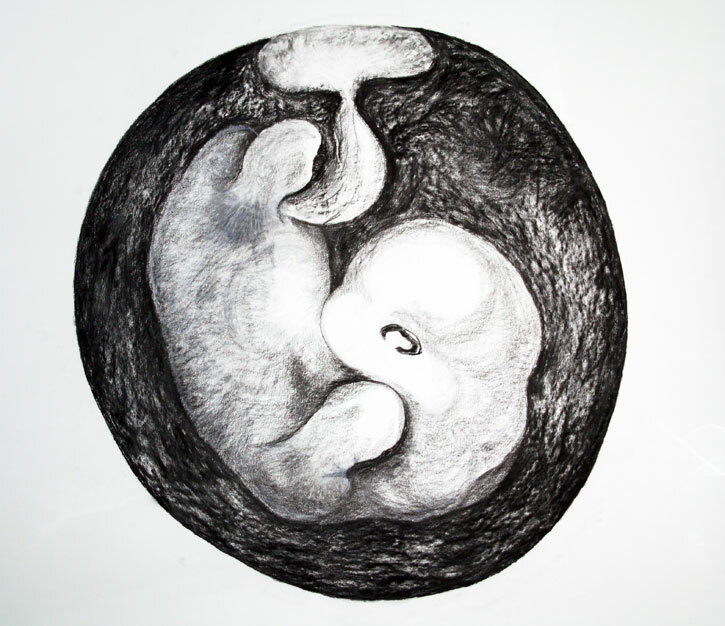 A missed abortion is when the embryo has died but not yet miscarried. In fact it’s a term that is no longer in use, because of the connotations attached to the word abortion. Quite recently by common consent researchers agreed to replace the term abortion by the word miscarriage when used in this context. It’s a normal part of human reproduction that approximately 15% of all recognised pregnancies will miscarry. The reason in half of these is unknown but by directly looking at the embryo and analysing its chromosomes this paper provided some idea of what may be happening. This is not what really interested me though. What really interested me was the comment during the questions session after presentation of the paper that parents found that to have a photograph of their child and an understandable explanation for its death was immensely valuable. I was interested in the gap or rather chasm really between the academic and the personal and how these are influenced by my own personal and academic reactions. In the final year of my Zoology degree I specialised in embryology and genetics and after graduation joined the lab of Dr John Gray. Dr Gray was an extraordinary man who ran the cytogenetics service for the Newcastle region; we remained friends until he died. I learnt to analyse human chromosomes but more importantly as cytogenetics then was a very new science we also met the patients. Much of our work involved analysing the chromosomes of severely disabled babies, and I remember the shock when I saw a baby with a serious chromosome abnormality for the first time, and I presume that this is a similar reaction to that experienced by some people when they view Nearly but not Quite. In my case the shock lessened with the more abnormalities I saw and I now regard difference as a normal part of life. 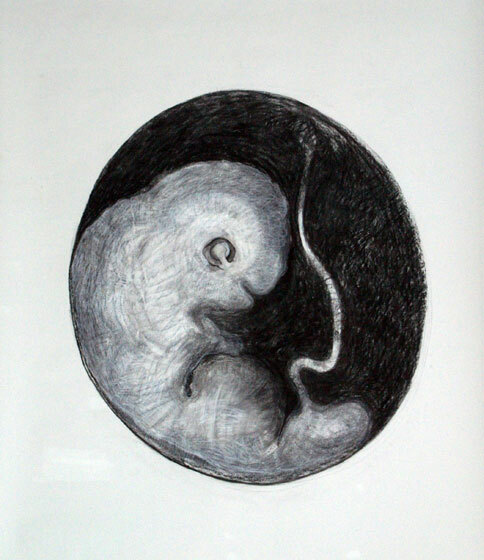 In 1992 I joined a group at the Jessop Hospital in Sheffield studying the physiology and pathology of the human endometrium, or lining of the womb. The purpose was to better understand the ‘chemical and cellular messages’ that pass between the mother and a successfully implanting human embryo. The aim of this research was the development of treatments that could help women suffering from repeated miscarriages or implantation failure after IVF to give birth to a healthy baby. We concentrated on the changes that take place in the womb lining during the three days that it is receptive to implantation of the embryo, and compared the changes in women who had had children with those in women in which the implantation process did not appear to be functioning properly. I worked with this group for 15 years, and one of the things that struck me was that when I met people outside of work and answered the usual question ‘What do you do?’ women I hardly knew would tell me about the babies that they had lost and how much their lost babies meant to them. These events then are the basis of the drawings. The drawings are portraits of small people who lived for a very short time, they were here and they carried all the hopes and dreams of their parents. In scientific terms they had not the neural development to be conscious but they were made real in the minds of their family and that matters. Incredible images …….good to bring experience from ‘another life’ into art. 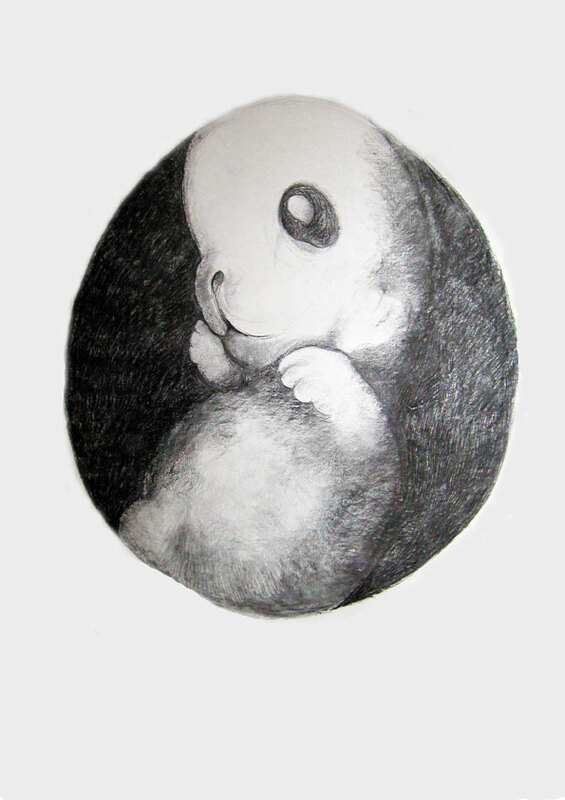 Extraordinary charcoal image …….the rabbitness of the foetus. How many lost each year? What is the question that you really want to ask? How does the word interface with the image? The abstract with the absolute? The big charcoal drawing is the most compelling image that I have seen for a long time.